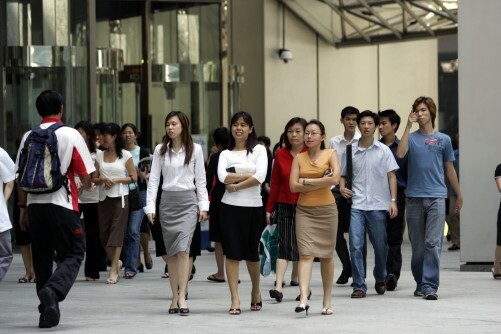 There have been more foreign professionals here over the years because the economy has grown and there are not enough Singaporeans to fill the jobs available, Prime Minister Lee Hsien Loong said at a forum yesterday. There are about 150,000 professional Employment Pass holders here holding a range of jobs from chief executives to lawyers. "Why are there so many? Because my economy has grown, I've created all these jobs, I don't have Singaporeans for all of them," he said in response to an undergraduate who asked when Singapore could slow down the influx of expatriates here. "Can I do with fewer? Maybe. Can I replace some with Singaporeans as they get trained? I hope so. If I send all of them home, will I be sorry? Yes, and I'm sure you will be too because you will not go to that job," said Mr Lee. This foreign talent policy creates new jobs for Singaporeans instead of taking them away from locals, said Mr Lee. He cited the example of a bank CEO who may not be a citizen but runs a bank that creates thousands of jobs. "You put the wrong CEO there, the bank goes bust, thousands lose their jobs," he added. But Singapore also ensures "fair treatment" of its citizens "so they won't have to feel the balance is tilted against them" in employment, said Mr Lee. Singaporeans also enjoy priority for public housing, he said later, in response to a student from China who asked why the Government had tightened rules on employment passes and housing for foreigners. "Public housing is a privilege for citizens and we give them the advantage over non-citizens and permanent residents," he said. For example, last year's rule that new PRs must wait three years to buy an HDB flat was a "fair requirement", said Mr Lee.